Rally Obedience (Rally-O) is intended to promote positive relationships between dogs and owners based on trust and respect. Rally-O encourages participation of ALL dogs purebred or mixed breed, pets or titled champions as well as physically-challenged dogs and/or handlers. Rally-O is a venue for those who desire an activity that is fun and games. It is not simple or easy, but challenges handlers and dogs in a partnership that improves heeling and teamwork. The ability to work as a team during a Rally-O performance, the handler’s ability to maintain the dog’s attention and attitude at a high level are all challenges. This, along with variability incorporated into course designs and formats, creates a fast moving continuous performance. Rally-O is designed so that dogs at all levels of training may participate. A beginner’s course may include heel, sits, turns, pace changes, sit-stay and elements of recall. 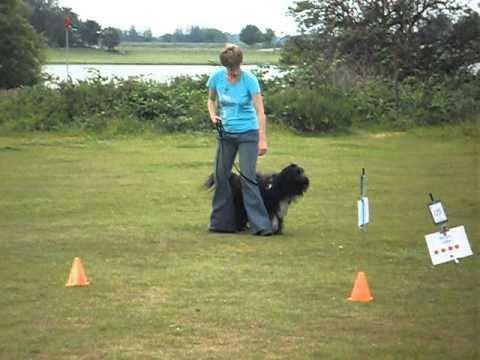 As the dogs gain skill, more difficult elements are incorporated into the courses which will improve you and your dog’s performance levels and confidence. Rally-O is offered by CARO (Canadian Association of Rally Obedience), CKC (Canadian Kennel Club), AKC (American Kennel Club) and UKC (United Kennel Club) trials. The APDT (Association of Pet Dog Trainers) also offers Rally-O titles. Currently, the CKC is the only organisation which restricts competition to purebred dogs.